We actually saw SUNSHINE yesterday (the Mohawk Valley of Upstate New York sees sunshine about 1/3 of the year). Almost all our surface snow had melted, although the big dirty clumps of snow remain. It was actually rather pleasant, despite the mud! Today, the temperatures are back down below freezing and misty snow is falling. A few inches are expected today. The Mohawk Valley is a unique area of Upstate. It is the lowest geographic area of the state. Therefore, it is the cloudiest area of the state. We aren’t hit as hard with lake effect snow (snowstorms that travel from Lake Ontario to our west), but we do experience flooding. 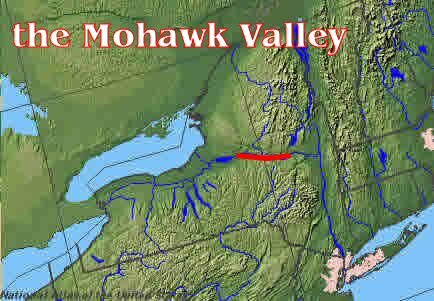 The Mohawk Valley used to be called the Gateway to the West because it was the only navigable route to the western frontier of the United States, until the railroads were built in the late 1800s. If you look at a map of the Eastern seaboard, we’ve got the Appalachian Mountains from the Carolinas up to the Pennsylvania/New York State border, and we’ve got the Adirondacks and “Northern Appalachians” northward up to Canada. The only area where people could transport their goods and their families west was up the Hudson River and westward through the Mohawk Valley. It is the reason why New York State is such the “melting pot” state that it is. The centuries of transmigration through our state has formed its character. We are an impatient, transient, restless people. There’s a terrific online book by the late Paul Keesler, called Valley of the Crystals; if you want to learn more about New York, that’s a great place to start. It is believed that the first inhabitants of what is now New York were the Algonquin Indians and the Iroquois Indians (these are the European names given them). The Iroquois Indians consisted of numerous tribes; the groups that populated the Mohawk Valley were, as expected, the Mohawks. They were a very fierce and territorial tribe, so this part of New York was considered the “wild frontier” and remained largely unsettled because of the fierce clashes between the Europeans and the Mohawks. The Revolutionary War (in which the Mohawks sided with the British– the losers) ended the Mohawk’s land claims. (During the Revolutionary War, Upstate New York was a hot bed of civil clashes between patriots and loyalists. Besides the 100+ battles fought here, there were terrorist raids by British, Loyalists, and their Indian allies. 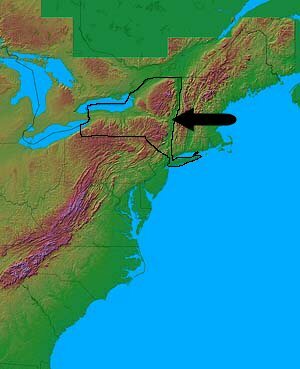 So much of the Mohawk Valley was destroyed by fire that this period is called “The Burning of the Valleys” to this day). After the war, the “wild frontier” was rapidly settled. The construction of the Erie Canal sealed New York as the Empire State, leading an entirely new era of entrepreneurship, and spawned the Industrial Revolution in the country. And in the 1820s, a religious revival that began in Adams, NY, led by Charles Grandison Finney, spread across the state and across the nation. 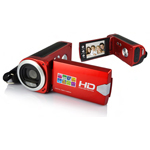 This eventually spawned religious revivals across the world in Wales, Scotland, and the Scandinavian countries. The Mohawk Valley became known as the “Burned Over District” because of the zeal and fervent devotion of Christians. From this revival sprang movements for women’s rights and the abolition of slavery. New York State– and especially the Mohawk Valley– led the nation once again. I did not grow up in the Mohawk Valley. I am a relatively new import, although I am a New York native. I’m actually a descendant of the Algonquin Indians, so I don’t suppose I can get any more New York native than if I sprang out of the soil. Living in the Mohawk Valley is a interesting experience. The area is very self-absorbed. I don’t mean that in a necessarily negative way. This area is very cloistered and not as cosmopolitan as, say, Syracuse or Binghamton. And there is no desire for the Mohawk Valley to become cosmopolitan; the people of the Valley seem to like their traditional ways. I suppose this is what attracts young families, as the Mohawk Valley touts itself as a wonderful place to raise a family. In June 2006, Upstate New York was hit massively hard with flooding catastrophies. The rain just never seemed to stop. My own property has been flooded a dozen times in the past decade. I dug up this old YouTube video of a restaurant in a nearby town that was washed away in the floods. The second video is an aerial video of the flooded Mohawk River. The pictures are stunning. New York has been experiencing another series of battles over the years, this time for the heart and soul of the state. Horrible economic and legislative policies tailored to benefit New York City at the expense of rural Upstate has caused New York to spin into a nosedive. New York is expecting to lose at least two congressional seats after the next census, due to severely declining population; New York is losing its political clout and seems to have forgotten its roots. It was actually Upstate’s Erie Canal and Finney’s Great Awakening that made New York City the hub that it is and the success that it found, but I think those facts have been forgotten. Time will tell if New York will see another awakening. I’m a big fan of history and enjoy the chance to learn more about every state and region in our wonderful country. I am writing a paper on the Mohawk Indians in New York in the 18th century and their struggle with settlers. Can you direct me to more sources where I can see maps of the Mohawk territory and their movements? May I please insert your map of the Mohawk Valley gateway into my soon-to-be-submitted-for-publication manuscript on American history? Wonderful article. I live in Fonda and our business is located in Amsterdam; and we love it here. If it weren’t for the fact that living and doing business in New York gets more and more expensive with each passing year, I would say we have the best place on Earth. Michelle, I agree. It is SO beautiful here, but the scenery SO expensive. I, could use much help, I, am doing family history, & much of it, seems to have taken place in the 1800s to 1700s, Mohawk Valley in your state. I, am frantic to find my ancestors located in this valley. Who, can I contact to do so? Any local historians, Please help if you can. Thank You. Jeannie from Wisconsin. brother Joe, Father David Price.